ENRIQUE CASTILLO-BARRANTES, Minister for Foreign Affairs of Costa Rica, conveyed respect and admiration for the complex transitions to democracy propelled by popular will in Tunisia, Egypt, Libya and elsewhere in the Middle East, as well as solidarity with the “desperate screams” of the women and children suffering in Syria. At the same time, he expressed worries over the resurgence of territorial conflicts, war rhetoric among some States and the insensitivity of autocratic regimes. The peaceful settlement of disputes was central to Costa Rica’s foreign policy and was deeply rooted in its commitment to diversity, tolerance and the rule of law. A few days ago, the Assembly supported a follow-up text to the July 2011 resolution sponsored by Costa Rica and other countries on mediation. In the 1980s, his country had propelled one of the most successful processes of mediation in the history of the hemisphere, which culminated in the Central American Peace Accord and “silenced the guns.” Unfortunately, today the region confronted a challenge of similar proportion. Drug trafficking and organized crime was plaguing Central America, which had become a transit route between drug production centres in the south and consumer countries in the north. The region’s limited capacity had impeded regional efforts to prevent and repress those ills. To confront the scourge, it was working to expand opportunities for youth, improve police capacity, strengthen the effectiveness of the judiciary and assist addicts. Citizen security was improving, he said. Homicide in Costa Rica, the lowest in Central America, fell from 11.7 for every 100,000 inhabitants in May 2011 to nine in May 2012. Reported cases of crime fell from 12 per cent in 2011. Still, as drug cartels remained strong, more well-balanced strategies were needed to combat it. Costa Rica had recognized the jurisdiction of the International Criminal Court since 1973. At the end of 2010, it asked the Court to rule over Nicaragua’s move to illegally deploy military forces and civil personnel in Costa Rica. In March 2011, the Court ordered Nicaragua to remove its forces from the disputed zone and it gave Costa Rica environmental custody. But Nicaragua had consistently evaded that order to the detriment of bilateral relations and in violation of paragraph 31 of the Final Declaration of the Rule of Law adopted by the Assembly last week. He condemned and denounced that. He lamented the lack of consensus to reach a global arms trade treaty in July. A co-sponsor of that initiative, Costa Rica would not back down on its attempts to promote such an instrument. Since adopting sustainability as a development model several years ago, Costa Rica had improved its forest cover, generated 90 per cent of energy from renewable resources and turned more than 20 per cent of its national territory into national parks. It aimed to be carbon-neutral by 2021. But that would serve little without the commitment of the biggest carbon emitters and international cooperation for mitigation and adaptation in the most vulnerable countries. Middle-income countries like Costa Rica needed the global community’s support to further improve economic conditions and human development. Costa Rica would continue to participate actively to improve the methodology guiding the “graduation” processes of the United Nations Development Programme (UNDP). 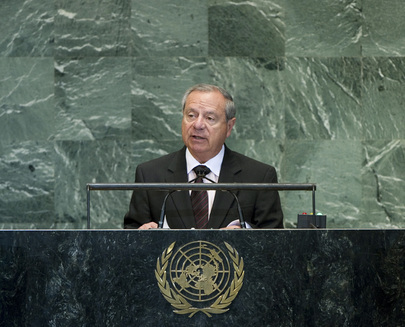 He called for making the United Nations more efficient, inclusive and representative. He was committed to Security Council reform; improving its working methods must be ongoing. He stressed the importance of the United Nations Declaration on Human Rights Education and Training recently adopted by the Assembly. Also, it was unacceptable to insult anyone’s convictions, practices or religious symbols, but the right path for response was open dialogue and respect for others and respect for human life. He rejected violence as a response to messages considered offensive. He condemned the killing of the United States Ambassador to Libya and his staff. Further, Costa Rica was committed to human security. He celebrated the recent Assembly resolution that advanced the common understanding of that concept, and he stressed the value of the principle of the responsibility to protect. Together with Australia, Denmark and Ghana, it had promoted a network of national focal points on that principle. He invited all Member States to join the network.